I'm super excited to share with you our February stamp release in full. I truly hope you enjoy all these fun critters and sentiments as much as I do. They are super sweet and I can't wait to see what you all create with them. We have 5 new stamp sets that are being released today. All stamps are in the CDD Shop and now available for purchase. 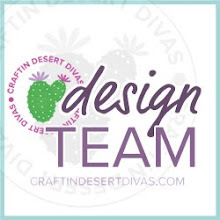 Next month we will be celebrating CDD stamps 1yr birthday! I have a special announcement coming soon for our March release. My first project for today is a 3D treat container. 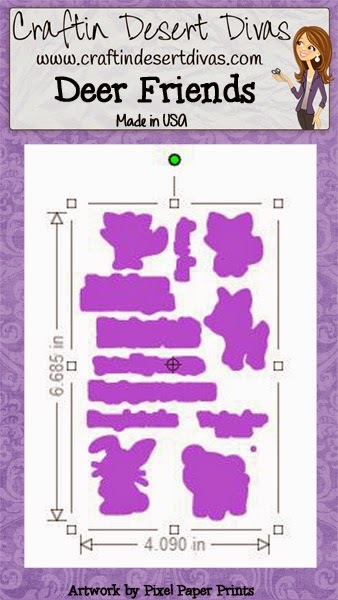 I found this in the Silhouette Store #63447. 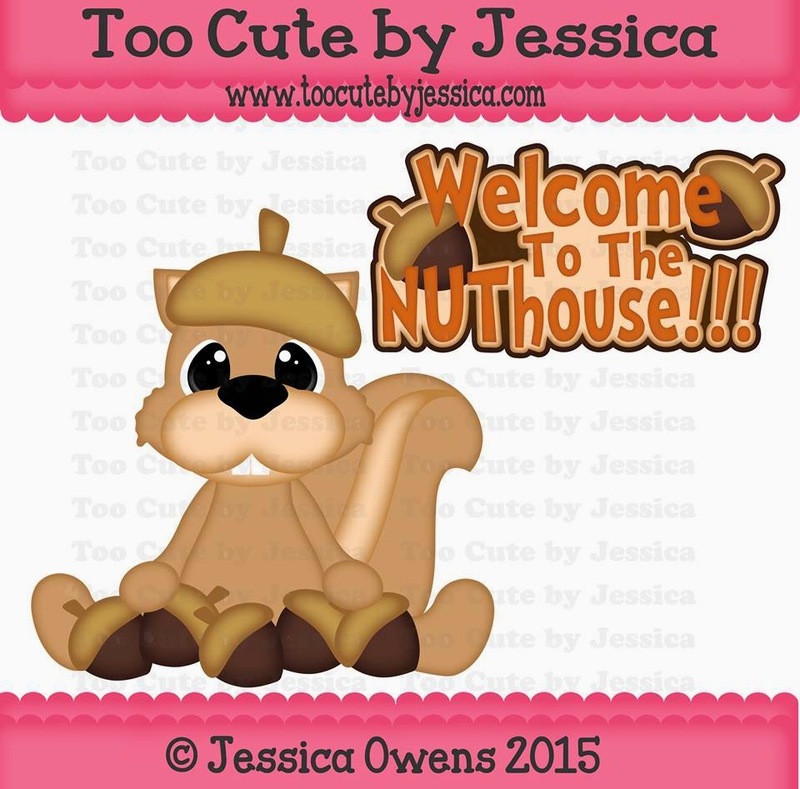 It is a nut holder, but I thought how cute would this be to have as a party decoration. 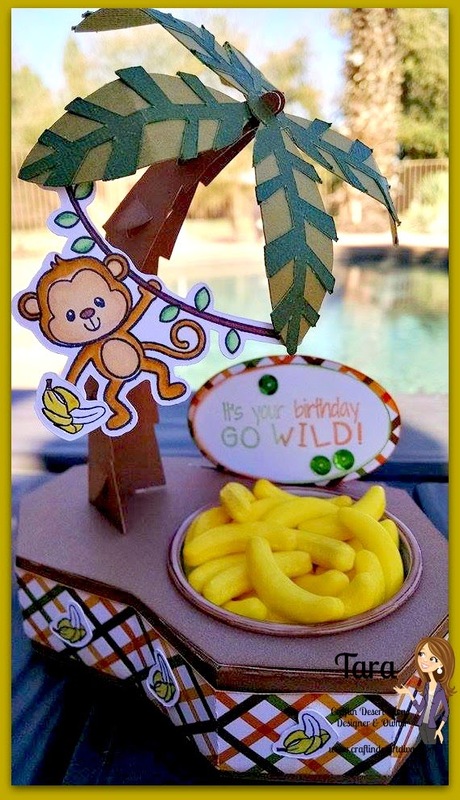 You could use this for jungle or circus theme birthday party or even a animal theme baby shower . 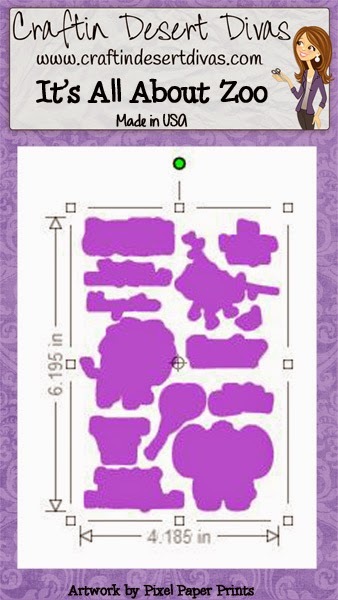 All you would have to do is change up the paper and treats and it would be super cute to set a few of these on tables!! It was super simple to put together. 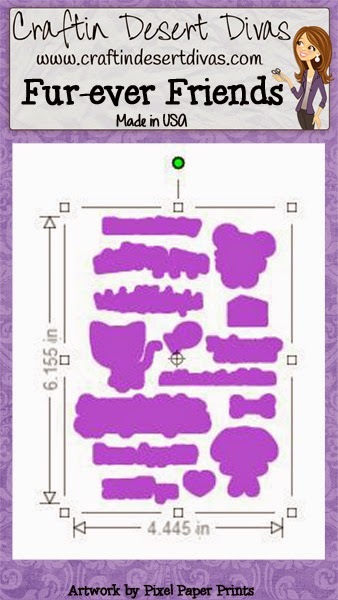 I cut the SVG outline for the monkey from the It's All About Zoo stamp set. Colored him in with my Spectrum Noir markers. I also cut out and stamped the bananas and put them around the base of the platform. The monkey is attached with some glue dots. To finish it up I stamped the sentiment from the same stamp set in a couple of colors to match the paper. I think these are super cute and would be a great hit at any party!! I made this simple card. The tag is from my Tag It Stamps and I think it makes a perfect layer on this card. 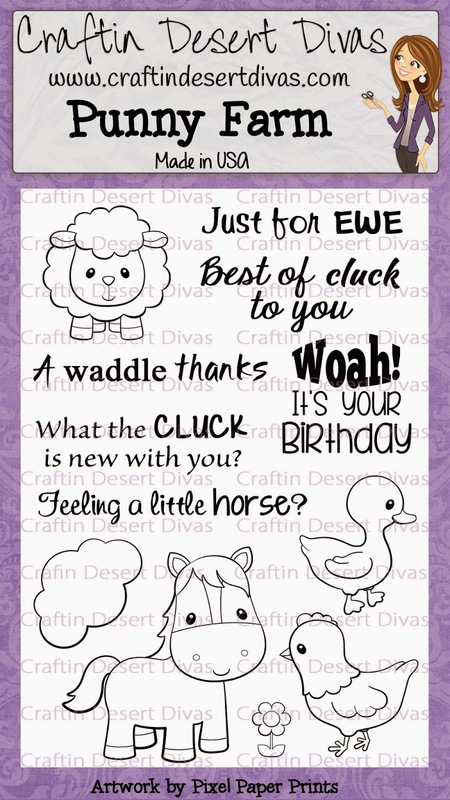 I just love this chicken from the new Punny Farm stamps!! Don't you just love that fun sentiment? I sure do. 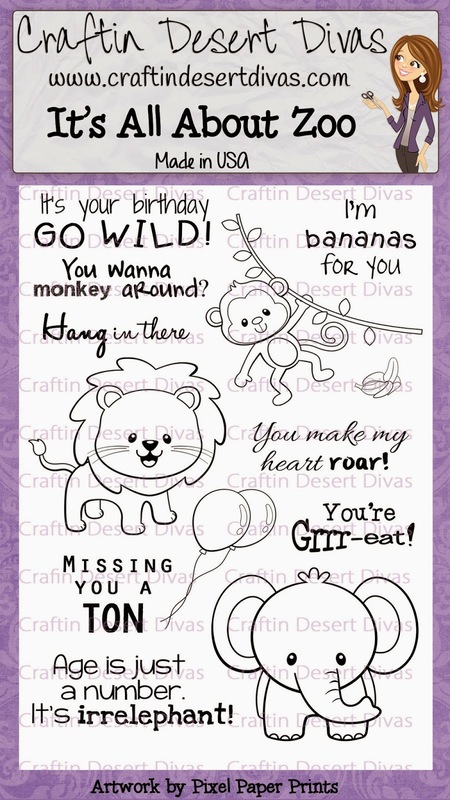 I have to say all these sets have some super cute sentiments that can be used for a variety of occasions. A few weeks ago I saw a card by my DT member Saundra and she had used some thread on her project and I just loved it. So as you can see she is my inspiration for this card. To finish it up I added some sequins, sprinkles and ribbon. 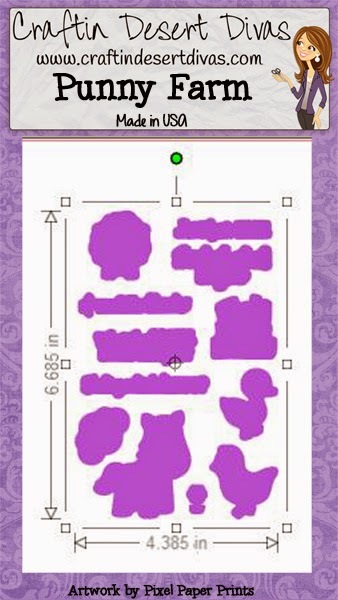 I basically did the same thing to this card but I did cut some heart shapes out of the patterned paper. I thought some hearts would be a perfect touch to go with that sentiment. I added some thread and sequins and it was done. I have to say I think this cute little raccoon is one of my favorite images from this whole release!! That is it for me today. As you can see I really love these fun stamps!! I have some new projects to share with you tomorrow. Be sure to check out the entire DT projects they have done an amazing job this whole release. We have a new lineup and freebie for tomorrow's hop. 1. 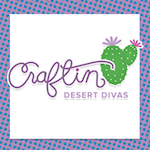 Craftin Desert Divas- 1 stamp each day. 2. Too Cute by Jessica - $25. gift card for regularly-priced patterns. I love the treat box. They monkey is adorable! Cute treat containers and cards!! I love the treat container, it's super cute. Tara, you already know you have me sold on It's all about Zoo but now I have to think I might need at least another set!! Darn you and your cute projects!! TFS now off to hop and spend money! Such a cute treat container!! TFS. The monkey is darling! Great idea for the treat box and banana's. 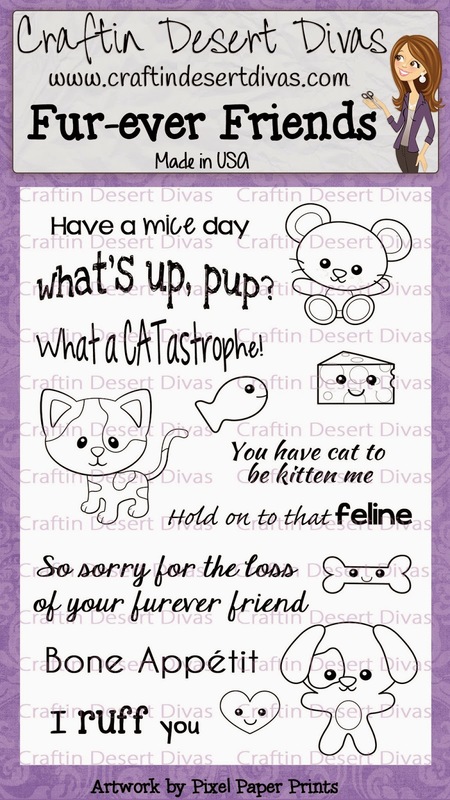 Cute cards and sayings. Super job! Love the stamps. The treat holder is adorable, love the monkey. The chicken is so cute and I love the "chicken" wire background. Great projetcs Tara! I love the treat container!! Awesome treat container!!! 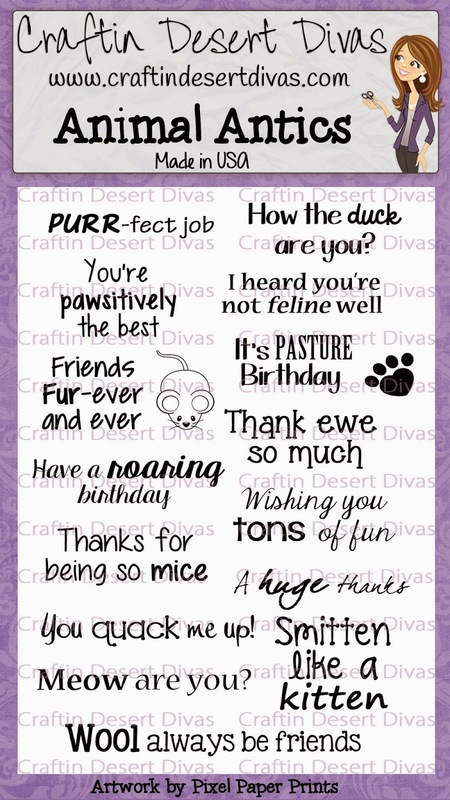 And fabulous card ideas! Thanks so much for sharing. So cute. I love the treat holder. Your projects are always amazing and day one of the hop was full of cuteness!! Love the new releases, the chicken is my favorite so far! Your projects are absolutely amazing! I love all of your creations, I wish I could quit my job and tackle all of them! Love your projects, but I found a lot of bad links in your hop for some reason. I followed the best I could. Such a cute little monkey treat holder. Love your cards as well. Wow, Tara...great projects today! Your treat container is the cutest! 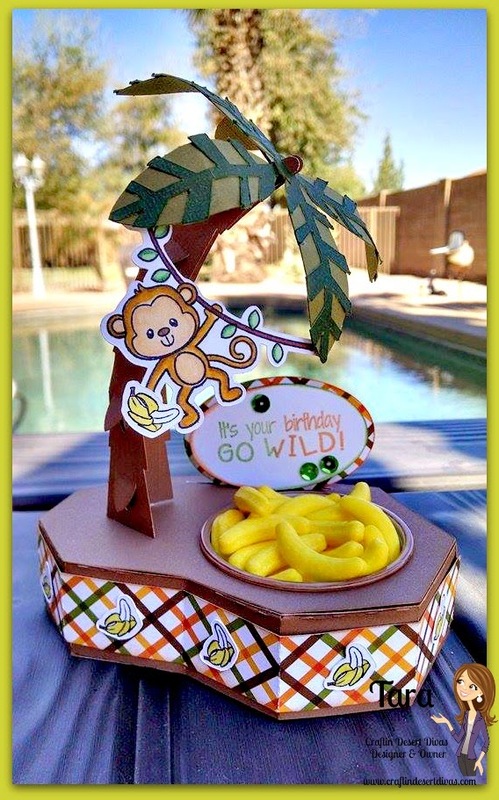 I love that darling monkey and this would be perfect for a animal themed party! love it! Your card is darling:) The background on the chickie card is so fun! This release is adorable! Your projects are fantastic Tara !!! I love each and every one of them !!! That is such a cute project! Such cute projects!!! Love this release!! Tara, I love your monkey treat container! It is so adorable! Your cards are also so cute! I really love these stamp sets! I can not stand how FUN these all are! Seriously awesome! Hope you are having a GREAT weekend my friend! Love ya! 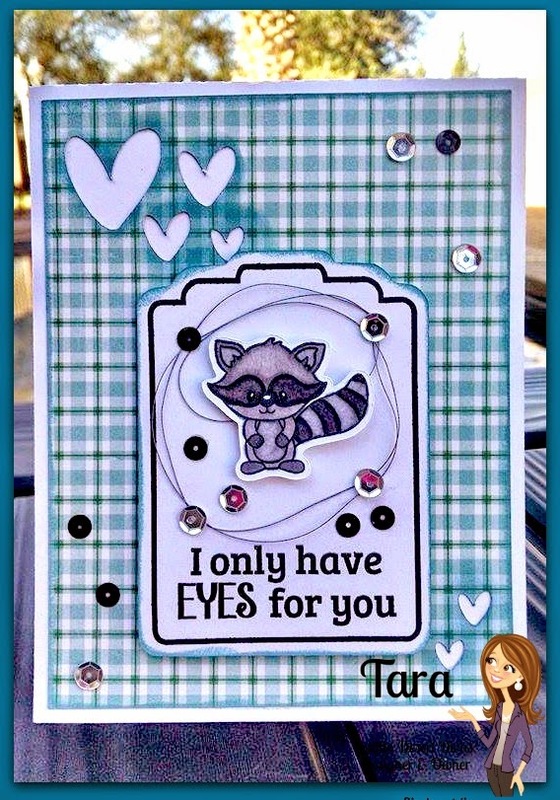 I am loving those cute cards Tara, and what you did with the but holder is awesome!!! These stamps are too cute for words!! Oh my cuteness, all 3 of your projects are awesome. You just have such a great knack for mixing the right papers, embellishments, colors and sentiments to make the most beautiful projects. Tara, all three projects are adorable!!! The monkey treat (banana runts - yum) holder is so so cute!!! Great stamps sets!! Love the new stamps! Your projects are awesome! great job on everything, but I absolutely love that monkey treat bowl, amazing!!!!! Love all your projects!! Already bought Animal Antics!!! love the stamps and your projects. the treat holder is so cute. i love the taste of them banana candies. Oh man these are just amazing!!! 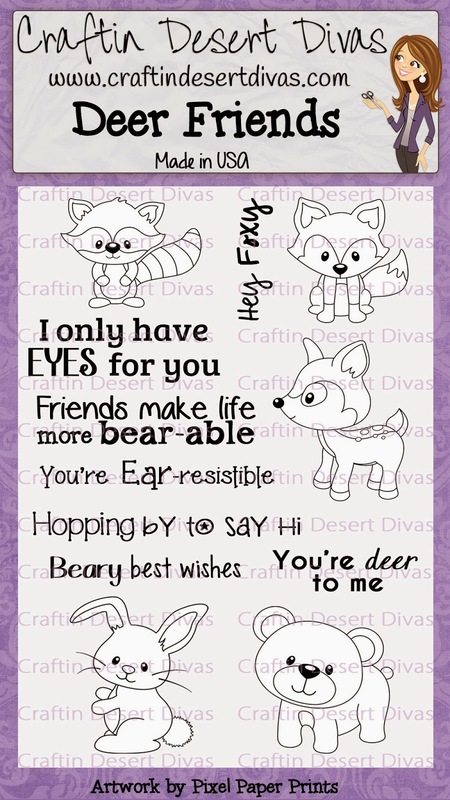 Love the cute animals and the sequins is a good idea I am going to use. Love the center piece and quick card ideas!! I love the monkey! The container is so fun! What a great idea to use a raccoon with that saying! Such fabulous project. Love that table top decoration, so cute and love the designs of the cards. Congratulations on another fabulous release!! What the CLUCK! That's AWESOME :-) And the treat container is adorable! LOVE, LOVE, LOVE this little treat holder...bananas are MUCH BETTER than nuts!!! LOVE THE MONKEY TREAT HOLDER AND ESPECIALLY THE MONKEY. I ALSO LOVE THE RACCOON CARD. THANK YOU! Fun projects! LOVE the treat holder - Fabulous new stamps! LOVE the new stamp sets!!! Your cards are super cute!! Love the touch of the string. Great job!!!! These are awesome!!! Love your chicken card! OMGosh these are ADORABLE. Thanks for sharing. Sorry I'm a little late for the hop, but I love the treat container. All of the projects are great.